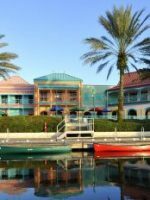 When the setting sun sinks into shimmering waters of the Trumbo Canal, Disney’s Old Key West Resort transports visitors to a South Florida sunset celebration. The vista shows a parade of pleasure boats, palm trees and a bustling street scene as its backdrop, complete with hurricane drinks, lighthouse views and steel drum music. 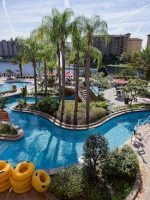 Encompassing 156 acres in the Downtown Disney neighborhood, the 549-unit resort overlooks Lake Buena Vista Golf Course. The hotel debuted in 1991 and is among the oldest, most spacious and most affordable Walt Disney World Deluxe Villa properties. By day, visitors can rent bikes or boats and enjoy a scenic ride to Downtown Disney along the Trumbo Canal and the Sassagoula River. 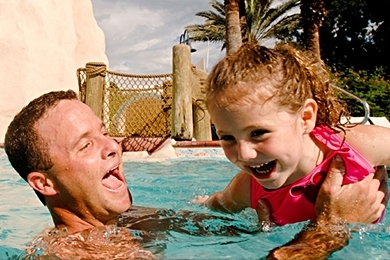 When the mercury rises, kids can splash and swim in one of four resort pools, including a fun-filled feature pool with a sandcastle-themed slide. When evening comes, extended families can convene on expansive porches for snacks and sunset-viewing, or meet on the “Turtle Krawl” (the resort promenade) for cocktails and conch chowder. 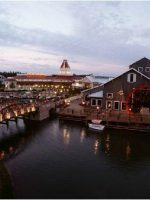 Those with more time on their hands can board a boat to Downtown Disney for a full night of shopping, dining and merry-making. Villa accommodations range from Deluxe Studios, which sleep four guests, and a child under 3 in a crib, to three-bedroom Grande Villas which sleep up to 12 people. One- and two-bedroom villas accommodate five and nine family members, respectively. One-bedroom and larger accommodations feature full kitchens, separate laundry rooms and expansive living rooms. Porches with extra elbow room are a space-stretching bonus for extended families. While many families favor the resort for its “getaway” atmosphere, the downside of its remote location is ease of transportation throughout Disney World. If you’re typically in a hurry, it’s best to have a car. 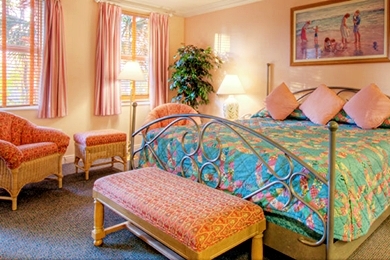 Located in 56 pastel two- and three-story buildings, accommodations at Disney's Old Key West Resort are among the most spacious and affordable in the Disney Deluxe Villa category. Designed to reflect a South Florida scene, rooms display linens, artwork, accent pillows and accessories that feature images of seashells and the Florida Keys. One-bedroom, one-bathroom villas sleep up to five guests, plus a child under 3 in a crib, and feature a Jacuzzi tub and a shower in an adjoining bathroom off the master bedroom. Two-bedroom, three-bathroom villas sleep up to nine guests and an infant. Three-bedroom, three-bathroom Grande Villas accommodate up to 12 family members, boasting bonus features, like an extra dining table and a second floor. Grande Villas are in limited supply and may be reserved up to around nine months in advance by calling central reservations at 407-934- 7369. In villas, open and expansive kitchens adjoin inviting living rooms in what may be the homiest Disney Vacation Club accommodation layout. Families will appreciate easy-to-clean wood floors, large dining tables and kitchen islands that double as TV cabinets. Villas with one or more bedrooms feature dedicated laundry rooms containing full-size washers and dryers. All accommodations feature a Pack 'N Play and a balcony or a patio. High chairs are stocked in all villas, and bed rails are complimentary upon request. Wi-Fi is complimentary. Deluxe Studios sleep up to four, plus an infant. In addition to a kitchenette with a microwave, a toaster, a coffee maker and a mini-fridge, these accommodations contain two queen beds. Most other Deluxe Disney Villa properties feature the sofa bed and traditional bed combination in similar room-types. For Studio guests, laundry rooms are located in all four resort pool areas. Use of the machines is complimentary. Besides peaceful golf course and canal views, of particular note at this property is the generous size of the patios. If the weather is fair, these inviting outdoor sitting spots can serve as an extension of living space, allowing older relatives some extra elbow room while the kids play or watch television. For maximum convenience, request lodging near the Hospitality House, which will afford you easy walking access to the resort's main pool and recreation complex. For a quieter, but still entertaining experience, consider a stay near the Turtle Pond Pool. Most buildings lack elevators, so request a ground floor villa if you're traveling with stroller-age children. We stayed in a studio apartment on the ground floor. This comes with 2 double beds, tv, dvd player, table and chairs, kitchenette, wardrobe and a bathroom. The room was really spacious for just us 2 in it and the beds were very comfy, easily the best beds I've experienced in a hotel situation. We stayed in the Old Turtle Pond area of the resort which has a bus stop for taking you to the parks, Disney Springs or just back to the main building, where you can also get a boat to Disney Springs. All the staff are extremely friendly and helpful. Everyone from the housekeepers, desk staff, shop etc are really knowledgeable and happy to help. When we arrived, it was quite late (11pm) and of course it was a little thin for staff at that time, but that's to be expected when the bulk of people usually arrive during the day. If you're going to arrive late I would definitely recommend doing the bulk of the check in via the app, this speeds up the process a lot. We were then given the bell service to get to the room, as are room was almost a mile from the hospitality house. This was a great service as the bell guy was very knowledgeable of the layout of the resort and gave a quick tour of the different areas. Of course, with it being late we forgot most of it, but it was appreciated nonetheless! The is also a drinks fountain here, for those that have the refillable cups. Too late into the holiday we realised there was a laundry there too. Useful for cleaning clothes before you come home, or if you're staying there a long time. As an addition, there are some picnic tables and bbq area next to this pool. However, I would recommend making the effort to go to a wallmart (or similar) for supplies for this as the food that is available in the shop is overpriced for that kind of thing. I really love the relaxed lay back feeling you get when you arrive at OLD KEY WEST. Everyone is friendly, helpful and so helpful. I asked to be on an upper floor with a building with an elevator. They gave me that and a beautiful view of the golf course. The whole resort is beautiful. They have quite pools, and fun children pools truly there is something for everyone. And Disney Springs is a boat ride or bus ride away. The buses are pretty good. I never had to wait very long for a bus to come. And the other guests were all very happy with the rooms they had too. Just chatting at the bus stops with them. I can't wait to go back. It really feels like a neighborhood in Key West, Fl. The resort's 149,600-gallon main pool features a fun-filled circular slide, designed to resemble a giant sandcastle. Nearby, there's a small kiddie pool, a sand play area and a lighthouse sauna. Staff-led activities on the pool deck range from "Water Balloon Toss" to "Goofy Bingo," and regular pool parties feature music and games. Towels are available on the pool deck. Complimentary life vests can be checked out at Hank's Rent N' Return. Swim diapers are required for non-potty trained children. They can be purchased at Conch Flats General Store, along with baby and toddler supplies and limited groceries. Pool hours are 7 a.m. to midnight, while lifeguard and slide hours are 10 a.m. to 10 p.m. In the vicinity, several interconnected play structures offer fun for kids from ages 2 to 12. There's a soft sand surface underneath, and a sun sail shade is above. Nearby, there's a sand volleyball court, a basketball court and a fire pit. The latter is the site of frequent campfires and S'mores. Between Buildings 41 and 42, a smaller (but still sizable) Old Turtle Pond pool provides plenty of sunning space on the deck, and is generally less crowded than the main pool. 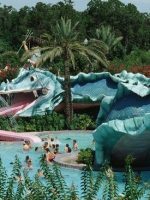 A large playground (recommended for children between 2 to 12 years) is adjacent and features a sun-sail shade and several spring-loaded animal ride-ons, like a dolphin and a seahorse. Nearby, there's a small Jacuzzi and a covered pavilion with picnic tables. Heated pools and playgrounds are also located in the Miller's Road and South Point neighborhoods. At this equipment and rental shop with a window to the resort promenade, you can borrow traditional or surrey bikes. Rental boats will float families along the Trumbo Canal and the Sassagoula River toward Downtown Disney. You can also borrow volleyball, basketball, shuffleboard and tennis equipment. Hank's Rent 'N Return is open from 9 a.m. to 10 p.m. Bike and boat rental hours vary by the season. At this gathering spot for guests, kids can play games like foosball, pool, air hockey or Playstation 3. Kids can enjoy coloring a picture, playing board games or making craft projects, like "Make a Button" or "Make Your Own Beaded Jewelry." For little ones, there's a play tent and a few toys. You can rent DVD's here, too. Hours are 9 a.m. to 10 p.m.
Two small arcades provide temporary diversion. The Electric Eel Gameroom is located near the main pool, just across from a Ping-Pong table on the promenade, while the Flying Fish Gameroom is adjacent to the Turtle Shack Poolside snack bar. Hours are 8 a.m. to 10 p.m.
Near the main pool, two lighted tennis courts are available for match play. An additional court is located near Building 34. Aspiring, young buccaneers ages 4 to 12 can join a nautical treasure hunt on a two-hour Pirate Adventure Cruise. The cost is about $36 per child, and includes a snack and some loot. Times are 9:30 to 11:30 a.m. on Tuesdays, Thursdays and Sundays. 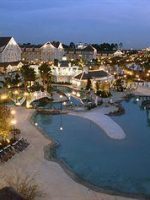 The excursion begins and ends at Disney's Port Orleans Riverside Resort, with stops at Disney's Old Key West Resort, Disney's Saratoga Springs Resort and Downtown Disney. Tee off at Lake Buena Vista Golf Course. Resort guests receive a discount on daily and twilight greens fees and two-round passes. Make sure to reserve a tee time in advance. Transportation to and from the course via taxi is complimentary. See the resort Concierge for information and a voucher. Screenings of family-favorite Disney films are complimentary by the Family Tree. The resort's only full-service restaurant features American fare with a Caribbean influence. Choices for kids under 10 include Mickey-shaped waffles and Daisy's Sand Dollars (mini-pancakes) for breakfast. Cheese pizza, Mickey pasta with a choice of sliced apples or a yogurt parfait and grilled fish with whole-grain pilaf and yogurt are available for lunch and dinner. Kids lunch and dinner meals are served on a Mickey Mouse-shaped plate -- with side dishes located in his "ears." A container of crayons is provided at each table, and highchairs are plentiful. Seating is available indoors and on a covered outdoor patio. Don't miss the view at sunset. Hours are 7:30 a.m. to 10 p.m. Located next to Olivia's, this quick-service storefront and refillable mug station dishes up sandwiches, salads, conch chowder and snacks. For kids, breakfast options include French toast sticks, an egg platter or a la carte pastries. Lunch and dinner choices include hot dogs, turkey sandwiches or PB&J sandwiches. Kids' lunch and dinner meals come with a choice of two sides and a beverage. A "Mickey Check" snack pack with yogurt, fruit, crackers and a beverage is also available. Although it's not on the menu, staff will serve a soup and sandwich combo upon request. Picnic tables are located nearby on the Turtle Crawl, and high chairs are available. Hours are 7 a.m. to 10 p.m.
At this snack shack near the Old Turtle Pond Pool, kids will find familiar favorites like turkey and PB&J sandwiches or cheese pizza. Kids' meals come with a choice of two sides and a beverage. Picks for older diners include pizza, hot dogs, tuna sandwiches or Caesar salads. For dessert, try a Mickey ice cream bar. Dine on the pool deck or in a covered picnic area nearby. Open seasonally from 11 a.m. to 5 p.m. 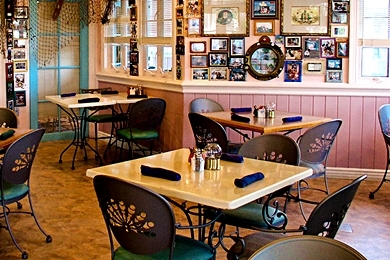 The Key West-style bar offers an array of wine and beer selections for adults, as well as cocktails for happy hour. Enjoy options from Olivia's CafÃ© here for lunch and dinner, too. Open from 11:30 a.m. to midnight. If you don't feel like cooking or eating out, you can order a whole pie, as well as beverages and desserts, for delivery to your resort accommodation. A $3 delivery charge applies, and there is an 18 percent surcharge for gratuity. Hours are 4 p.m. to midnight. Order essentials before you arrive, and save time and trouble. Local grocery delivery options include Gardengrocer.com, WeGoShop.com and Goodings.com. Limited groceries and infant and children's essentials can be found at Conch Flats General Store. Hours are 7 a.m. to 11 p.m.
For a single price, enjoy unlimited refills on tea, coffee and soft drinks. Beverage stations are located at Good's Food to Go and Turtle Shack Poolside Snacks. 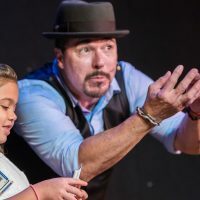 From boat captains who hand out rings and bubbles to children to Airline Check-in Counter staff who go out of their way to make sure you make your flight on time, this resort does a great job of catering to visitors of all ages. At holiday time, regular guests deck out their porches in lights and decorations. In all seasons, villa porches and tables on the resort promenade are popular stations for sunset celebrations. 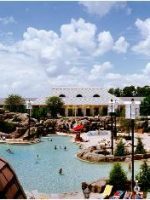 Overnight guests enjoy a number of special perks, like early-entry and late-stay theme park privileges, free onsite transportation and free parking. Guests can also participate in a Disney Dining Plan with a Magic Your Way Package. 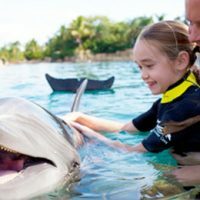 Additional family-friendly privileges include online room check-in, resort airline check-in, the ability to make FASTPASS+ reservations 60 days in advance and airport transportation service via Disney's Magical Express. On the resort promenade, a fitness center features a full range of equipment. Access is available 24-hours with a resort-activated keycard. Jogging trail maps are available from the Concierge. Next door at the Spa at Saratoga Springs Resort, get pampered with a massage or a reviving treatment. Treatments for kids' ages 4 to 12 are available. Hours are 8 a.m. to 8 p.m. Kids Nite Out, an independent agency, provides in-room resort childcare. Rates are $16 per hour for the first child, with a four-hour minimum and a $10 caregiver transportation fee. 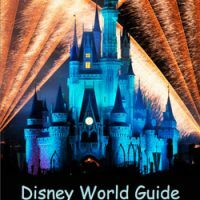 From Orlando International Airport (MCO): Free roundtrip airport transportation via motorcoach is available to guests via Disney's Magical Express. Advance reservations are required and limited hours may apply. 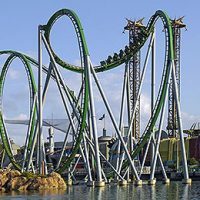 To reach the resort by car, take the South Exit Road from Orlando International Airport to SR 417 Toll Road West, also known as the Central Florida GreeneWay, and follow signs to Disney's Old Key West Resort. Complimentary transportation by bus is provided to all Walt Disney World Resort theme parks, water parks and Downtown Disney. 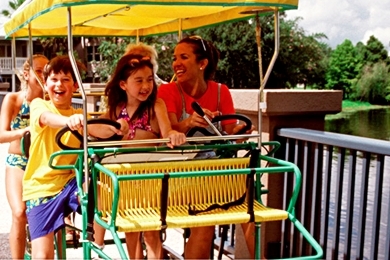 The Downtown Disney Internal bus stops frequently at the Hospitality House, providing guest access to the main pool, dining and recreational activities. Due to the resort's vast, remote location, it's best to bring a car. Parking lots are conveniently located directly next to accommodations, which makes arrival and departure easy. Although you can catch a boat to Downtown Disney West Side, direct service to Downtown Disney-Marketplace from Disney's Old Key West Resort and Disney's Saratoga Springs Resort has been discontinued. To reach the Marketplace from Old Key West, take the green flag boat to Downtown Disney West Side, where you can transfer to another boat bound for the Marketplace. If it's early in the day, you'll need to walk from the West Side to the Marketplace. The trip is a little over half a mile. Bring a stroller that will collapse on pontoon boats if you're traveling with small children. Book a babysitter, and head over to the Gurgling Suitcase for a cold cocktail. Alternatively, you can tee off at Lake Buena Vista Golf Course, or board a boat to Downtown Disney for dinner and shopping.